Minestrone! 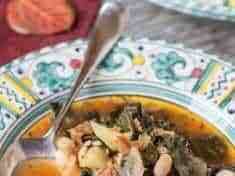 We’re talking hearty soup, soup loaded with earthy beans, tender noodles, and leafy greens. In Italian, minestrone translates to “big soup”, a slurp-able healthy meal, a super adaptable soup recipe. 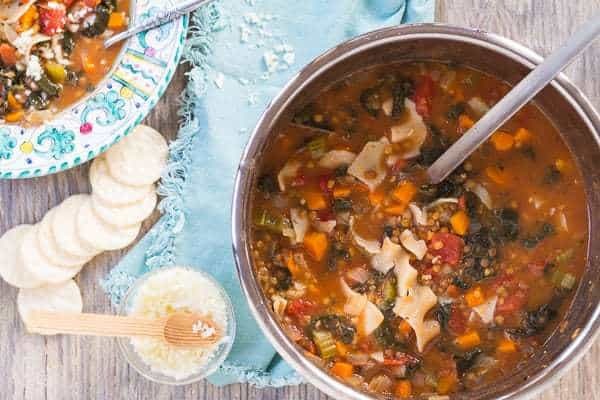 Follow this easy basic recipe for lasagna minestrone soup with lentils and kale and learn how to personalize your own big minestrone soup! 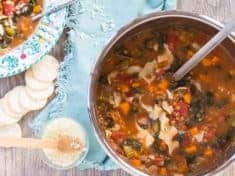 Vegetable minestrone is hands down, my go-to soup. First, because our pantry always holds some sort of pasta, several varieties of beans, and a can of diced tomatoes. Second, because I’m one of those cooks who thinks about what’s for dinner at the last minute and I need recipes like minestrone soup. Third, using a pressure cooker, minestrone soup is done fast, fast, fast! Now, just because I always make soup in a pressure cooker doesn’t mean you have to. Like what if you don’t have a pressure cooker or Instant Pot? Absolutely, you must enjoy this minestrone, so I’ve included regular stovetop directions as well. 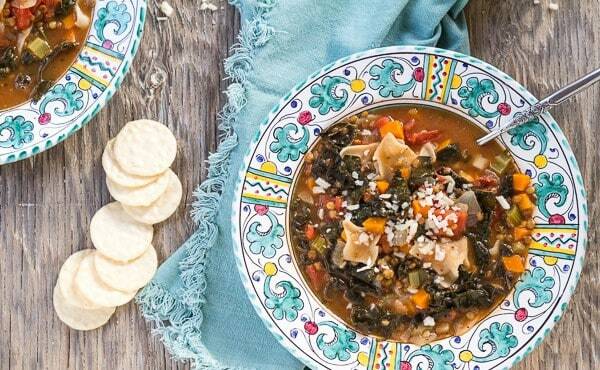 Please do—make this lasagna minestrone soup with lentils and kale. Make this your go-to template for similar soups with practically endless changeups. You choose your own favorite pasta shape, a companionable legume, and whatever leafy greens you happen to have on hand. 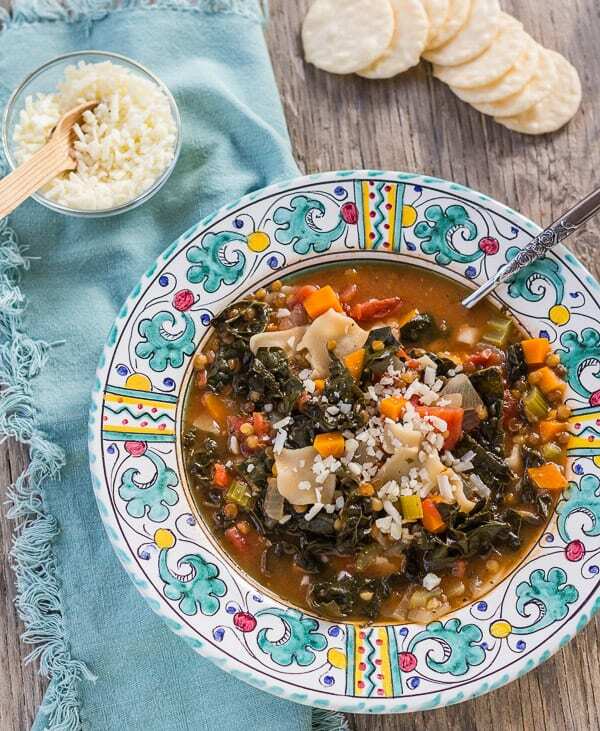 As the big long name indicates, this particular minestrone features ribboned strips of lasagna noodles, together with nutritious kale and quick-cooking rustic lentils. Built on an aromatic base of onions, garlic, carrots, and celery, everything pressure cooks (or simmers) in a tomato-spiked vegetable broth. Big soup! Cooked along with kale and lentils, the noodles come out on the softer side of al dente. I’m willing to forgo the toothier texture in exchange for one pot cooking. That said, if you want your noodles perfectly tender to the tooth, boil the pasta in a separate pot and stir into the soup at the very end. 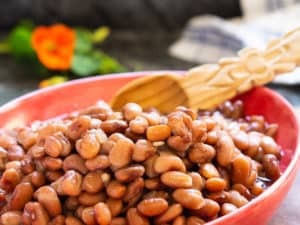 The same goes for beans that take longer to cook than lentils. Cook larger beans separately and heat them in the soup just before serving. 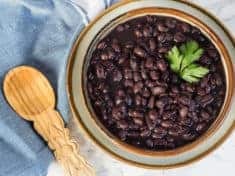 ** Feel free to substitute canned (drained and rinsed beans) instead of lentils—heat them in at the end too. Make it gluten free: Use gluten free pasta, and cook separately to make sure they don’t get mushy. For extra flavor depth, stir spoonfuls of basil walnut pesto into the pot. You might also like this recipe for spaghetti with greens, another delicious last-minute go-to meal. Make it a fabulous week– get in the kitchen and cook something delicious! Find daily vegetarian and healthy living ideas on my Facebookpage. on Letty’s Kitchen. Thank you!! 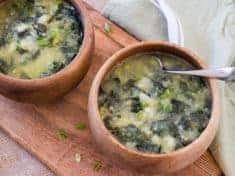 Hearty "big" soup, with noodles, beans, and greens--a recipe you can adapt to whatever you have on hand, another pasta, or beans, or leafy greens. Makes about 10 servings. Heat the oil with the Instant Pot pressure cooker set on Sauté. Stir in the onion, garlic, carrots, and celery. Cook, stirring frequently, until the onion is golden and translucent, 5 to 7 minutes. 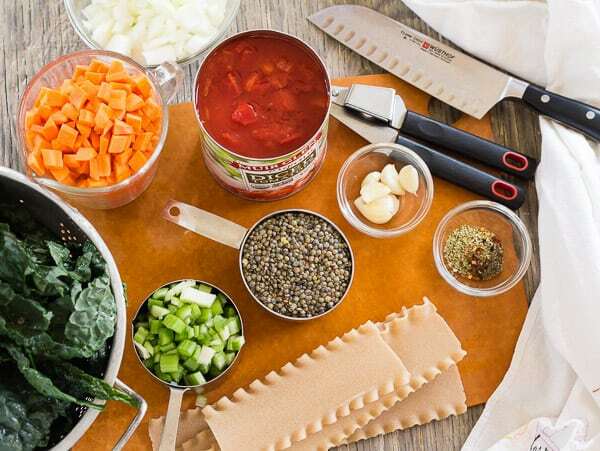 Add the tomatoes, vegetable broth, bay leaves, chopped kale, noodles, lentils, and salt and pepper. Lock the lid in place, making sure the steam vent is closed. Switch to Manual and set the timer for 4 minutes, high pressure. Switch to off and wait 4 minutes. Carefully turn the pressure valve to quickly release steam. When the valve drops, open the lid. Remove the bay leaves. Season to taste with salt and pepper. If desired, serve with Pecorino Romano or Parmesan cheese. Heat the oil in a large soup pot over medium flame. Sauté the onion, garlic, carrots, and celery until the onion is soft and translucent, 5 to 7 minutes. Add the tomatoes, vegetable broth, bay leaves, chopped kale, noodles, lentils, and salt and pepper. Season to taste with salt and pepper. If desired, serve with Pecorino Romano or Parmesan cheese. Sauté the aromatics first and then add the remaining ingredients. Lock the lid in place and bring the cooker to pressure on high heat. Lower the heat just enough to maintain high pressure and cook 4 minutes. Remove from the heat and reduce the pressure immediately. Follow the same basic instructions: Sauté the aromatics first and then add the remaining ingredients. Lock the lid in place and bring the cooker to pressure on high heat. Lower the heat just enough to maintain high pressure and cook 4 minutes. Remove from the heat and reduce the pressure immediately.